The United Arab Emirates said it would no longer grant visas on arrival for foreigners living in Qatar, while Qatari nationals were barred from transiting through the country. The worst crisis in decades among the Gulf's Arab monarchies intensified on Wednesday, with a Saudi-led alliance imposing more punitive sanctions against Qatar and a senior UAE official playing down the chances of a quick diplomatic resolution. The United Arab Emirates said it would no longer grant visas on arrival for foreigners living in Qatar, while Qatari nationals were barred from transiting through the country. Both decisions were relayed through state-run media. UAE residents who express support or sympathy for Qatar on social media could face a jail term of up to 15 years, the public prosecutor said. Three Gulf states -- Saudi Arabia, the UAE and Bahrain -- along with Egypt on Monday blocked their transport routes with Qatar, including the country's only land border. 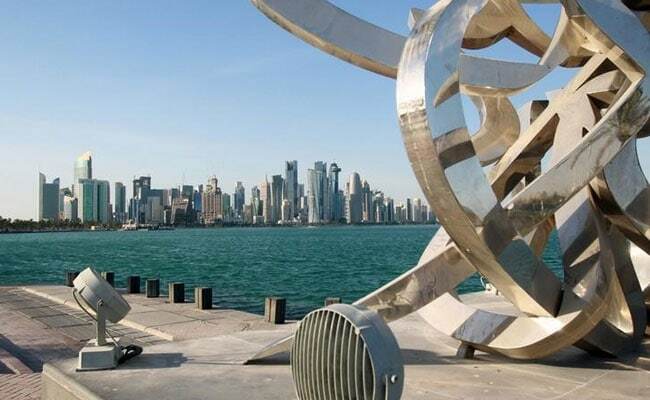 They accuse Doha of destabilizing the region through supporting proxies of Shiite Muslim Iran and the Sunni militants of al-Qaida and Islamic State. Qatar says the Saudi charges against it are a ploy for regional dominance over archrival Iran, the emirate's ally. Dispelling hopes that a solution to the impasse could be found soon, Anwar Gargash, the UAE minister of state for foreign affairs, said the alliance is willing to take further measures against Qatar if it doesn't pledge to overhaul its "subversive" foreign policy. In Berlin, Saudi Foreign Minister Adel Al-Jubeir called on Qatar to stop supporting "certain organizations," saying, "We don't have sufficient cooperation in this area." As the pressure on Qatar mounted, Kuwaiti ruler Sheikh Sabah Al-Ahmed Al-Sabah was shuttling among Gulf capitals in an effort to find a solution to a crisis that pits some of the world's richest nations against each other. President Donald Trump on Tuesday backed the Saudi-led measures, calling it just punishment for the country's financial support for extremists. "For us, this a critical issue and there is no turning back to the status quo," Gargash said on Wednesday in Dubai. "There has to be first a very clear political indication, whether it's to the mediator, whether it's to the GCC countries, that Qatar is changing course. You start with that. You can't start mediation when Qatar is in denial and I think right now we are in a phase where Qatar is in denial." Turkey -- which has sided with Qatar against Saudi Arabia in supporting the Muslim Brotherhood in Egypt and Hamas militants who rule the Gaza Strip -- criticized the squeeze on the emirate and offered to try to mend the rift through dialogue. "I'd like to say that we don't find sanctions against Qatar right," Erdogan said in Ankara late Tuesday. "We are ready to do everything to resolve other countries' problems with Qatar." With a population lower than Houston's, Qatar is the world's No. 1 exporter of liquefied natural gas. Its $335 billion sovereign wealth fund owns stakes in global companies from Volkswagen to Glencore and Barclays. But the crisis hit the Gulf country at a time when its economy was starting to face some headwinds amid the drop in global commodity prices. Moody's Investor Service cut Qatar's credit rating last month by one level to Aa3, the fourth-highest investment grade, citing uncertainty over its economic growth model. Qatar's ability to weather the pressure is "best measured in months, not years," Michael Cirami, who manages about $13 billion at Eaton Vance in Boston, said by phone. "So I am going to start to get concerned if this goes on for a month or two, not that I think they can't weather a month or two but because that gives us an idea that this isn't a quickly resolvable issue." The main question is to what extent Saudi will succeed in pressuring the Qatari royal family to turn against the emir, Sheikh Tamim bin Hamad Al Thani, said Mokhtar Awad, a research fellow at George Washington University's program on extremism. "The situation has escalated to a point that it is difficult to imagine" Saudi Arabia and the United Arab Emirates "backing down without Qatari capitulation or regime change," he said. Qatar's benchmark QE Index for stocks fell 1 percent at the close in Doha. The measure tumbled more than 7 percent on Monday, the most since 2009. While Gargash said he hoped that "cooler heads" in Qatar would prevail to defuse the crisis, he said the allies had tools to inflict more economic pain on the fellow Gulf Cooperation Council member if necessary. He denied that the alliance was seeking regime change in Qatar. The sanctions are meant to say to Qatar that it has chosen a route "that supports extremism, supports terrorism," Gargash said. "You can live with it but you are not going to be part of what we want to do and so you can't have both worlds."